Horror movies are about expectations. I speak in the broadest possible sense, of course. Part of what drives horror movies the first time you experience them is that you don’t know what to expect, you don’t have a clear vision of how this is going to go. They wouldn’t show you that girl gettin’ stuck on a meathook, would they? They wouldn’t, would they? You need those expectations of what’s not likely to happen so what does happen can shock. You don’t tend to see movies about watching one person just get tortured in one spot in slow agonising detail because that rarely makes for good tension, which is crucial to the feeling of good horror. They’re also genre film, which means from the perspective of the makers, they were trying to more make a checklist of things audiences expected rather than necessarily truly surprising you. Lots of early slasher films were kinda tech demos and special effects bouquets, just sort of made because filmmakers could think of interesting shots or scenes they wanted to make, and in many cases the plot just had to be hammered around it. Not to say that classic slashers, the ones that last, don’t actually have pretty decent plots. When a good storymaker has to build a story around plot points, they can do it, and the story can be good. That’s one of the ways you know it was made by a good storyteller. And that’s why there’s a lot of really forgettable dross that’s just, you know, gone and forgotten. This checklist design coupled with the tension-release cycle you want out of a good story tends to pull horror movies towards a list of familiar, expected tropes, and even give acquainted viewers a sort of wink-nudge-nod vision of their future. If you see a gun or a vicious looking prop or a knife or a mask somewhere in a horror movie, odds are really good you’re going to see it used to kill someone later on, a harbinger of spectacle, a prime for your expectations. 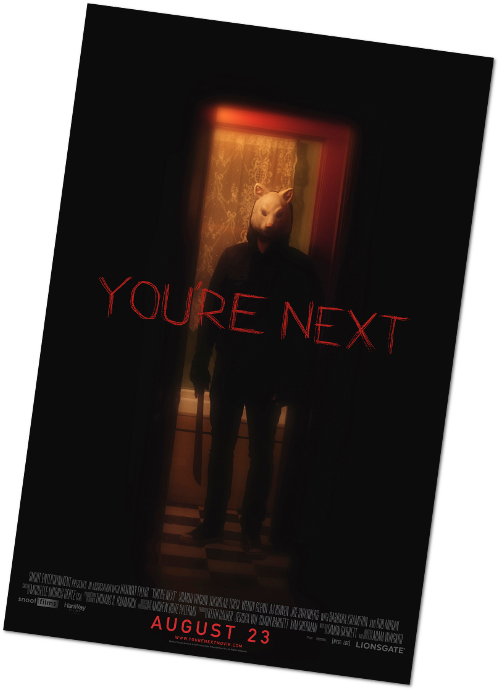 You’re Next is a 2011-2013 horror film with a premise you can get right off the rack. A dad and mom drive out to their summer home, isolated from the general populace, and invite their family of three kids and their partners to have a nice dinner together, celebrating their thirty-fifth wedding anniversary, a show of how much these people love one another and a celebration of their various careers and accomplishments. Then, during dinner, a masked killer kills one of the family, and what begins is a night of being terrorised by a monster in human form, who stalks the family with tools and traps and then eventually starts stalking them through the house, one by one, killing off the family members, in a gritty, hands-on display of blades-and-bolts violence. That standard plot brings in a bunch of other standard tropes, too! Cellphones don’t work, the neighbours have also been killed in a similarly gruesome way, and the threats in the story wear masks, keeping their expressions hidden, dehumanising them, making their motivations dark and inscrutable. It’s very important that you understand that the reason this movie starts with such a basic premise and basic plot twists is because it needs you to be very, very confident in what’s going to happen, then, subvert that at the start of events. Now, playing with your expectations is how horror works, like I said. What that used to mean is that a story would set up a scenario where you’re pretty sure you know what’s coming, then either deliver or not deliver on that expectation at the end. The jump scare, the it-was-just-the-wind or cat-jumps-out-of-a-crate moment, those moments work because the tension has been established and is being built and then you get your release. You’re Next works in reverse. It sets up a scenario you’re very likely going to feel comfortable with, and then before it can develop, it throws in a complication, a complication that defuses your ability to have expectations. It’s not that it does stuff that’s wildly different – you still get slasher movie moments, you still get failing cellphones and people being threatened with an axe and desperate pleading before a deadly threat with a knife, an implacable over-muscled beast surviving way too much in the face of someone scared and desperate and people showing their human failings and suffering from pain and emotional breakdowns and distress all at the worst possible times, but none of the characters you see doing that are doing it at the time you think. You’re Next is pitch-dark, extremely funny, and filled with satisfying moments you don’t normally get in a slasher movie. It justifies everything, it uses everything, and it doesn’t waste any of its opportunities to play with your expectations, and it does this without sacrificing its status as an exciting, dangerous, amazingly tense feeling slasher horror movie where you also get moments of exciting, heady satisfaction. I really liked You’re Next. But then, I like people in animal masks and violence involving meat tenderisers.